Impala is expanding it's engineering team to help us scale the platform that will power innovation in hospitality globally. You'll be joining a venture funded startup that is changing the way the hospitality industry works. You'll be working directly on building new functionality into the product as well as working on existing features. Cares enormously about developing professionally. We are accepting fully remote applicants within Western Europe. An office stipend is provided to all employees and frequent travel to team meetings is paid. All full-time employees will take equity stakes in the company. Make an application with us. Successful candidates will be contacted very quickly. Complete a 20 minutes initial interview with one of the team. Complete an 30 - 90 minute technical interview/pair programming session with our Lead Engineer. Have a final conversation with our co-founders. The process is extremely quick but we're highly selective. Experience in hospitality or working with PMS/CRS systems. Please note that we heavily favour candidates with a notice period of one month or less and those that include a cover letter. What the hell is Impala anyway? A competitive salary and equity based on experience. You'll be working in a company led by an engineer. You won't be asked to do the unrealistic and your skills will be tested and improved. You'll be working in a company that puts professional development front and centre. You'll have a demonstrable, strong role in product direction. We have an incredible culture and community. 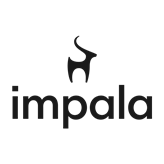 Want to get notified about new jobs at Impala?